Located in the Bugis area, near to Little India. 5-minute walk to the Bugis Junction and Bugis+ shopping malls, 5-minute walk from the Little India and Bugis MRT station, 10-minute drive to the Central Business District and Orchard Road, 20-minute drive from Changi International Airport. 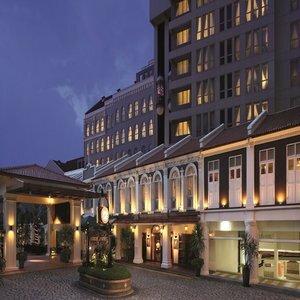 Located at Bugis and near Little India, Village Hotel Albert Court by Far East Hospitality is located at of one of the most culturally vibrant districts in Singapore. The hotel itself is charmingly restored from pre-war shop houses. The 210 rooms at Village Hotel Albert Court feature rooms designed with Straits Chinese influences and are equipped with modern amenities. Each air-conditioned room is equipped with a mini-bar, an in-room safe and cable television. The rooms come with mini-bar, cable TV and coffee/tea making facilities. Recreational facilities include a well-equipped gym, twin Jacuzzis and a steam room. Village Hotel Albert Court offers a variety of dining options. Albert Cafe serves a delectable spread of local and international dishes, while the popular Shish Mahal Restaurant offers authentic Northern Indian cuisine. Drinks and light refreshments can be enjoyed at the hotel lobby bar. As visa requirements often change at short notice, please check personally with your travel agencies or the respective embassies to ensure information is accurate for your specific purpose prior to departure.